How will Etsy changes regarding ‘handmade’ impact crafters, artisans? Amid the market-rocking news of shutdowns and the political impasse in Washington, a little news item about the online marketplace Etsy didn’t get much play. But if you’re looking for a good small business item to pursue, this one is likely of interest to many in your audience. 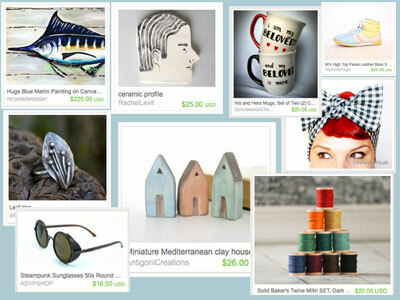 Etsy is the online marketplace for handmade and vintage goods, sort of an eBay for crafters and artisans. Last week it announced that it was changing its terms to allow sellers to hire help with shipping and crafting, and even to “apply to sell items they produce with manufacturing partners.” The company said this was because of the ongoing difficulty of defining “handmade” and noted that its “dos and donts” for sellers had ballooned to 14,000 words. With 1 million “stores” and 18 million items up for sale at any time, the site has a decent penetration — it’s sellers generated $895 million in sales last year — and the news seems to have been greeted with some trepidation. Earlier this year the Daily Dot reported that an invasion of manufactured goods on the site is jeopardizing Etsy’s niche as a venue for buying handmade items. I can understand why current sellers would be concerned about the effect on their livelihoods; I recall in the late 1990s printing out from a Bloomberg terminal one of the first press releases from a little outfit in California called eBay; for some years hence the site was a motley grass-roots digital garage sale that was fun for bargain-hunters and sellers alike; now it’s so complex and big that little guys and gals have a hard time standing out. If Etsy is swamped with imported merchandise and millions more commercial sellers, the result could be similar. You might want to catch up with some Etsy sellers in your area about the changes and how they think they’ll be affected. The Etsy site has an easy-to-use “shop local” search engine that will let you find dealers in your area. I would also recommend going to artisan guilds, craft/art fair organizers and local handmade goods emporiums (or places that sell supplies, like specialty yarn and paper goods shops) to find people who make and sell items. In fact, fall and early winter are hot times on the craft circuit, as Christmas bazaars, renaissance festivals and “maker faires” vie for their share of gift-buying dollars. A lot of people dream about making a living at their hobby; this is a great season, especially with the Etsy peg, to profile half a dozen crafters and ask about their business model. (Be sure to request actual documentation — bank statements, tax returns, etc. if possible to make sure they’re being accurate about revenue and expenses.) You also might look into the business of show promoters, some specialize in quarterly or seasonal bazaars for profit, while other groups run the sales as fundraisers. It’s a colorful, picturesque story that might help readers better understand the pros and cons of making a living creatively. The Craft and Hobby Association, an industry group, may be of assistance, and the Crafts Report, a trade publication for artists and crafters, offers a lot of interesting articles that may provide story nuggets. Sunshine Artists bills itself as a top art and craft show magazine, too.